Cookies with peanut butter and granola? Yes, please. 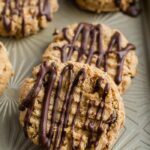 These peanut butter granola cookies are super easy to whip up and require only 5 ingredients! Make flaxseed egg. Add 1 cup of granola into your food processor and pulse until finely ground; transfer to a medium bowl. Add the peanut butter and flaxseed egg to the bowl. Stir the mixture until smooth. Add the remaining granola and stir until combined. Scoop tablespoon sized balls of dough and arrange them on the prepared baking sheet. Flatten the balls with the tines of a fork. Bake about 12-15 minutes or until the cookies are lightly browned around the edges. Let the cookies cool completely on cookie sheet, melt chocolate with coconut oil and drizzle it over the cookies. Place in fridge or freezer to let chocolate set and enjoy. Store leftovers in the fridge for up to 5 days. Recipe inspired and adapted from Food and Wine.